This restaurant is permanently closed. New Northern Italian cuisine with traditional technique. Chef Owned restaurant located in the Fashion District of Downtown Los Angeles. We provide a fine dining experience that all can afford to enjoy; including a wide variety of delicious wines. -Top 10 Winner for Best Overall, Best Food, Best Californian, and Best Restaurants in Downtown Los Angeles. The restaurant was closed down. Apparently it was closed when I made the reservation through open table. I can not believe open table could not have known it had closed down. My mother’s birthday dinner was ruined. I am very disappointed. Open table gave us a reservation for this place and when we arrived it was closed. Saturday night at 9:00. We spent money on a car driving us to a restaurant that wasn’t even open. Poor coordination on open table and Anatra’s part. Our anniversary dinner at Anatra was a complete disaster, because it never happened! We made a reservation for 6 o’clock on May 5. We traveled all the way from Venice to DTLA and when we got to the restaurant there was a notice on the door: closed for filming. We got no notification. It ruined our whole evening. Still trying to each the restaurant to get an apology at the very least. Awful experience. Are they closed for good? forever?? My co-worker had a reservation last month. When they got there, Anatra was closed with a sign that they have a "gas leak". There is nothing on their website to say they are closed, I called their number, it went to voicemail, I left my name and number, no return call. My review can't be very long because Anatra was closed at 7 PM on Saturday night. No one was there and the doors were locked. RIP Anatra. they had a gas leak so we didn't get to go. I would have appreciated it if someone had contacted me before we paid for an Uber to go there . So I can't comment on the food etc. We were looking forward to going to Anatra. I hope we can go some time. Again, sympathetic about their emergency but would have appreciated the courtesy of a call or text . Not sure why there is not a line out the door waiting to dine here. This is our second visit. Terrific food including pastas and Italian specialties. We had the vegetarian risotto which was as good as we have ever had. For entree, I had the lamb loin special and my wife the sea bass. Both were very well prepared. This is a bit of an out of the way location in Downtown, but worth the trip. We had a 9:45 Sunday evening dinner reservation. When we arrived to the restaurant at 9:45, it was closed. No call backs no apologies. Couldn’t cancel the reservation on OpenTable, therefore, we couldn’t make a new reservation, WTH? Couldn’t have been better. Service and food were wonderful. Lobster appetizer to die for - sea bass was cooked perfectly. Appreciated the smallish portions (just the right amount). Chef was very accommodating regarding one of our parties’ food allergies. Highly recommended - a great addition to DTLA’s gastronomic renaissance. Without question, Anatra is my favorite restaurant in Los Angeles. I have been several times with friends and family, each time we have had an excellent fine dining experience. The restaurant is beautiful, from the ambiance to the service to the exceptional cuisine. The quality of the ingredients and the execution of the dishes are perfection. I'm still making my way through the full menu, but my top two favorites right now are the rigatoni with duck ragu and the gnocchi with veal shoulder ragu. Also, if you have room for dessert, the raspberry chocolate mousse is exquisite. 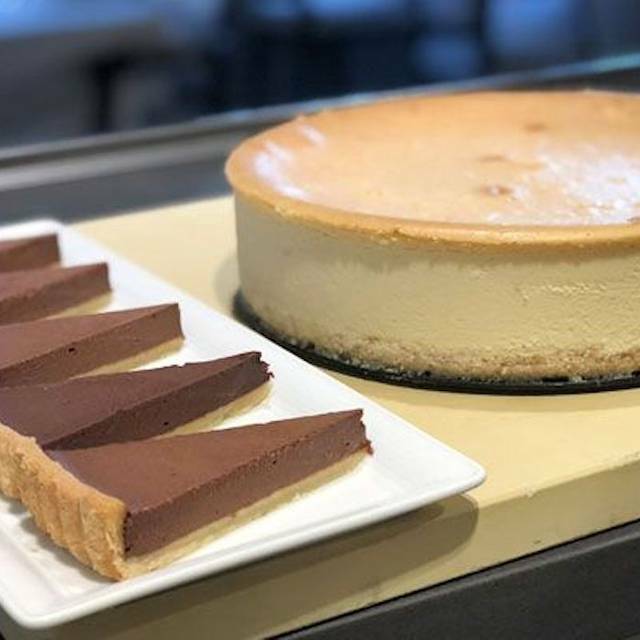 The cuisine at Anatra is comparable to what you typically can only get in Manhattan, San Francisco or abroad, such a gem to have in our City. 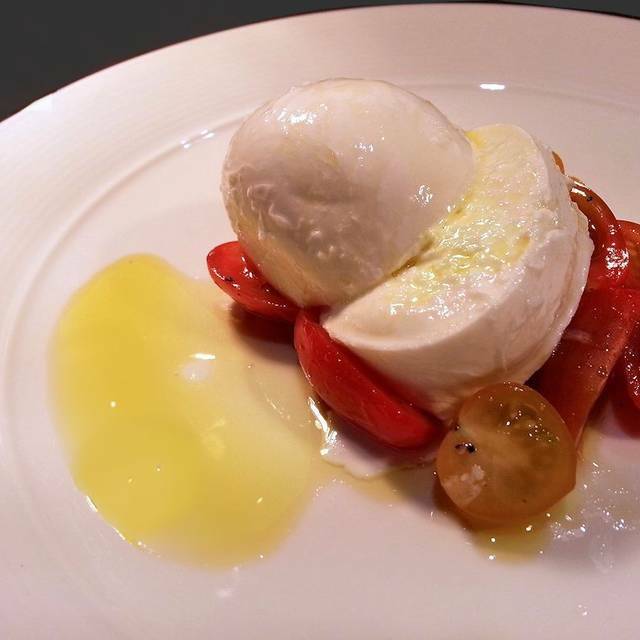 Anatra is authentic fine dining at its best. What a wonderful discovery!! This is an outstanding new restaurant and well worth a try. The food and service were exceptional. The Rigatoni with the Duck Ragu was the a favorite of our group (everyone loved it !!) They have a wonderful wine list. The menu is varied so everyone food something to their liking. It has a great space and is the perfect place to bring a date or friends if you want to have a conversation and hear each other. We will definitely be making Anatra a frequent dining destination. Not to be missed ! The menu -- well curated and outstanding -- fit on a single page, which is always the first sign that everything you get will AMAZE you. The setting -- simple, elegant, gorgeous. 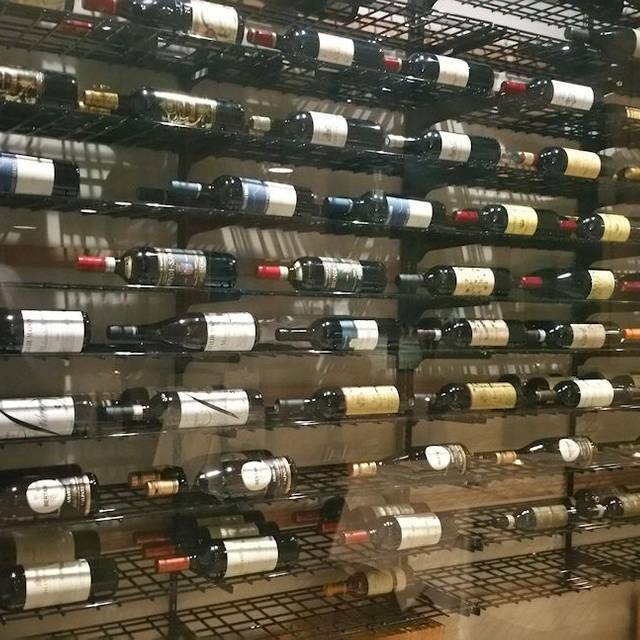 The wine selection? Also exceptional. We had the foie gras and lobster tail appetizers; quail risotto and prime rib as our main dishes; cheesecake and some lemony-goodness special that I can't recall for dessert. This place is a gem and a revelation, all at a good price. I highly recommend it! Chef Peyman Rasi nails it every time. 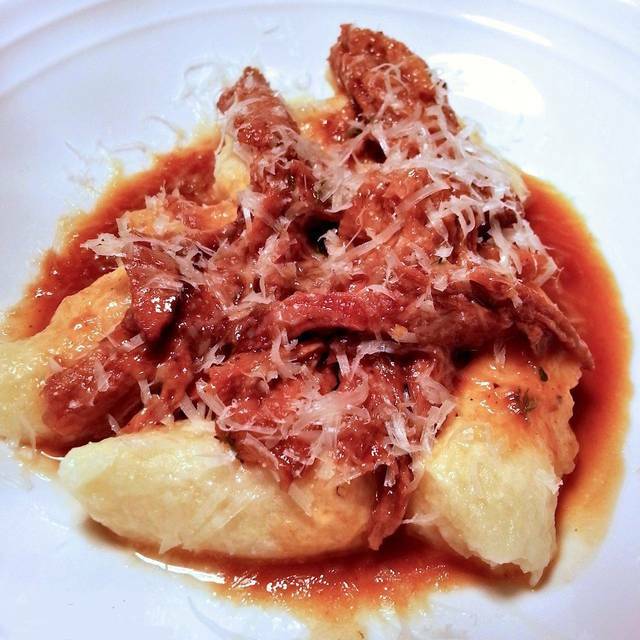 With a sure hand for classics, meat and game, a light touch for pastas including the most ethereal gnocchi in LA, he surprised us yet again at this last visit. We brought three last-minute guests who are vegetarians, and Chef created some fabulous dishes for them. Risotto loaded with delicious, deeply flavorful veggie melange, and his killer gnocchi, made with the classic butter sauce with crispy sage leaves (new favorite!). With starters of olive oil-drizzled imported bufala mozzarella + organic red tomato appetizer (caprese), followed by the luscious gnocchi and huge risotto, they were very happy and satisfied. But we still ordered desserts for the table (one of each, please!) and that took the experience over the top! Every luscious crumb of tender buttery crust, every drop of the red berry coulis and creme anglais sauces was wiped clean, leaving only pleasantly full tummies and big happy grins on our faces! Talent and humility like Chef Rasi's is very rare and deserves more patronage... we'll keep going back, and considering ourselves lucky! Impeccable service, excellent food and great ambiance! 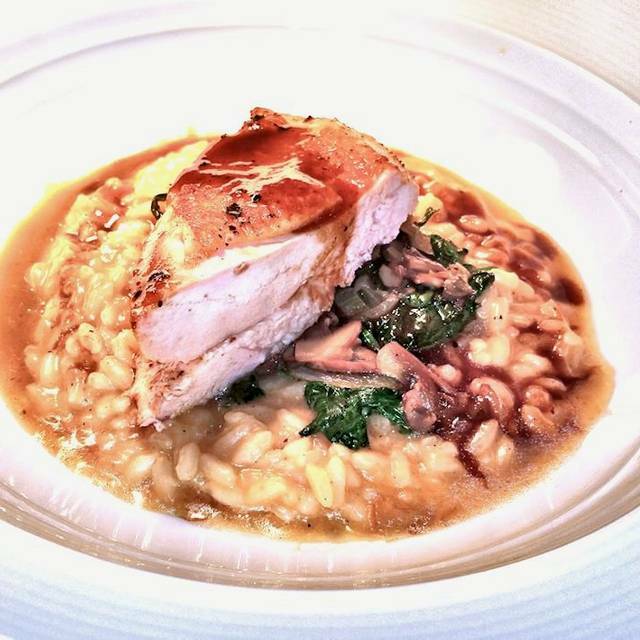 Anatra is a wonderful addition to the downtown dining scene. Our meal was beautifully prepared and the service was impeccable, yet friendly. I highly recommend this neighborhood gem. Don’t miss the scallops and definitely save room for dessert! We have gradually brought most of our friends and family here, and without exception, everyone LOVES the delicious upscale Italian-French food and wine at affordable prices, the lovely art, music, and comfortable design, and the great, warm, friendly and professional service. 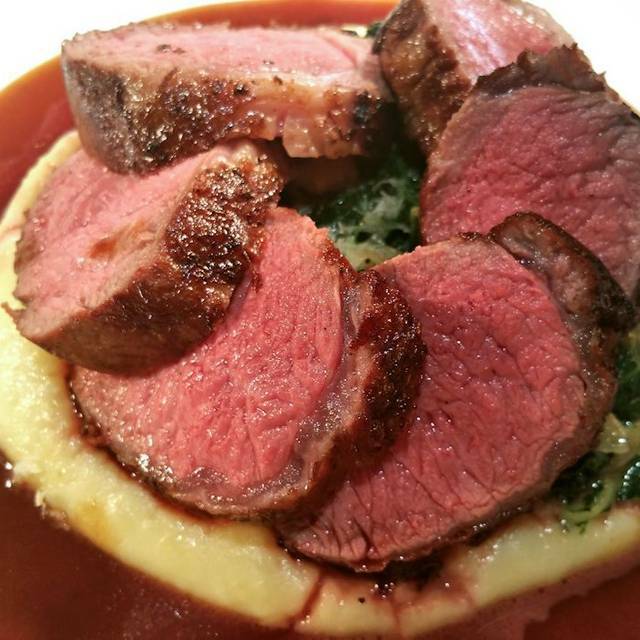 Delicious gourmet food and excellent wine list at reasonable prices. Everything is well prepared and presented. The best ingredients are used. Slow cooked items available on the menu. A beautiful restaurant that makes you happy and calm. The staff is warm and friendly. The only negative is the difficult parking, but it is worth the effort to go. Our favorite new restaurant, we have eaten at this neighborhood gem around once a week since they opened! Best food and best value in DTLA. 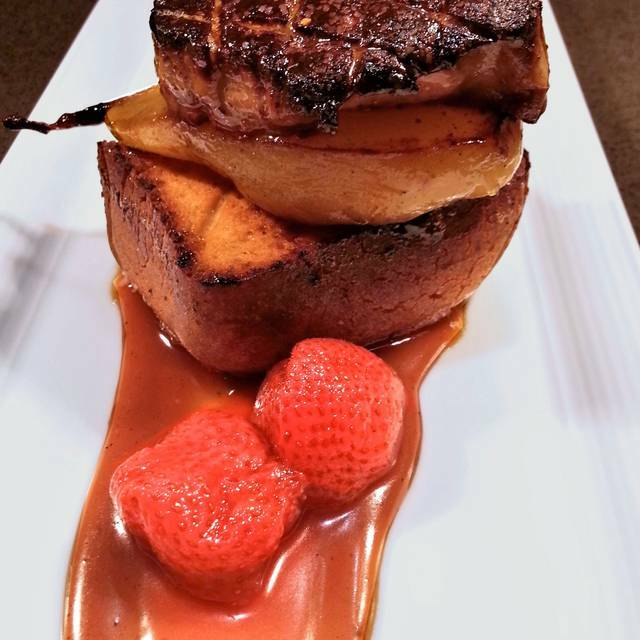 Exciting first courses include the lovely seared foie gras with poached pear and brioche on cardamom caramel with warm strawberries (just $19); or the tender poached lobster tail on green pea panna cotta with lemon vinaigrette and young arugula-- for a very reasonable $25! Another stunning first course has perfectly seared, fresh Scallops layered on creamy cauliflower puree with a corn-spinach mélange, topped with mushroom ragu, served on a long, narrow plate accented by round pools of green pea reduction; This is another beautiful, elegant dish that is more than just a pretty face….Unlike many upscale fine-dining restaurants that combine foods for the photographic (or shock) value, or try too hard to impress with the latest trends, Anatra’s food has an easy confidence, is ultimately comforting, and tastes delicious. As pretty and upscale as some of the dishes are, nothing is just for looks. This chef clearly understands how to make fine food become comfort food by making it taste great. The ambiance is romantic, subtle and elegant. Although parking was not ideal, this place was awesome!! The food, ambiance and service was exquisite. I had scallops for first and the risotto. Food preparation and delivery were right target! This is a hidden gem that will continue to delight customers. Wow!! Wow!! Wow!! 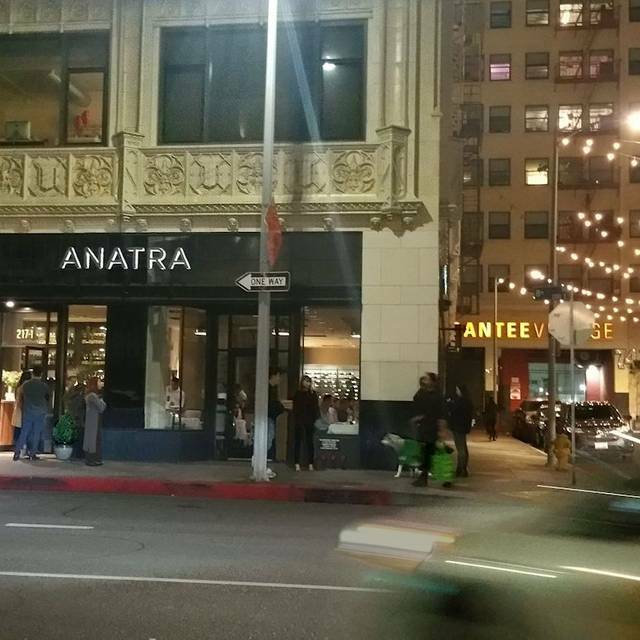 I have been living in DTLA for a decent time now Antara is a place I hope to see become a staple of the DTLA food culture. I feel like they rank with restaurants such as Per Se and Osteria. There is not a single detail of the restaurant that isn't perfect. The food is just amazing, the flavors are unique and hit every point, a true foodie delight. The menu is refined and elegant, simple yet complex. The service, top notch. The wine (and beer if you fancy) do not disappoint. Overall I thoroughly enjoy the dining experience and expertise of Antara and look forward to many more delightful meals. We ate in 5 restaurants during our stay in LA. Anatra was by far the very best. The food was thoughtfully presented and absolutely delicious. The service was excellent and the atmosphere sophisticated. The restaurant was quiet enough to have a real conversation. The decor was quite sophisticated. A great addition to the LA restaurant scene. Incredible food. A hidden gem in downtown. Valentine's Day. Overbooked, understaffed, waited 1 hour 25 mins past reservation time to be seated and didn't finish dinner until 11:40pm because it took 30+ minutes per course to arrive at the table - 4 courses. Complete Valentine's Day Meltdown. Most gave up on waiting to be seated or to be served their meals. We visited Anatra before a show at the Ace Theater which is nearby. The restaurant choices are growing in this area of Los Angeles with newer places like Anatra sprouting up. My wife had the Foie Gras which was outstanding. I had the Bufala which was similar to those I have had elsewhere. I can recommend the Risotto given the reaction of one of our friends. My Rigatoni was good but not exceptional. I had high expectations since our waiter informed us that the duck dishes were the specialties of the house...after all anatra is duck in Italian. The lasagna was delicious as well. The chocolate dessert, however, was the stand out for the meal. Good food and service! We went on a Friday night and it was all empty, considering the food quality that was a big surprise. Great food and great service. This is a pricy place (over $110 pp including wine and tip) but I felt like it was a good value for the quality. Server was great and would love to give him kudos by name, but sorry forgot your name. Blonde dude. Great job thanks. A new favorite! Reading the menu made me drool and the food did not disappoint. For the first course we had the scallops and the lobster, both were excellent- beautiful, unique and most importantly, delicious! For the second, we shared the rabbit lasagna which was unreal. Neither of us had tried anything like it before and we both can't wait to have it again. Rich and savory with melty tallegio, it was really exceptional. For the third course we tried the duck and the shortribs- both were delicious, and well prepared. No room left for dessert, next time. The service was amazing- friendly, knowledgeable, and on par with the food. Giorgio was lovely, informative and engaging. We also had the pleasure of speaking with the chef and thanking him for a very special meal. The restaurant feels like it's run by people who LOVE food, for people who LOVE food. Anatra is in a beautiful space, with remarkably comfortable chairs, but the location is somewhat unfortunate. It's a little too close to skid row for much foot traffic, but well worth going out of your way to visit. I know we will be making the trip again soon and highly recommend others do the same. Service was exceptional. Food was prepared perfectly. Found this restaurant on Yelp and noticed it had excellent 5 star ratings with great reviews. While the restaurant is not as close to the Staple Center (Closer to the run down side by the Flower/Fashion District) where I am accustomed to with the newer fine dining restaurants, the restaurant you could tell was nice, clean and upscale as soon as you drive up looking for parking. Parking was very easy, self park/pay lot adjacent to restaurant with a path from the parking lot to the restaurant so you dont have to walk around the block to 8th street. Excellent wine list, we ordered to Bordeaux and Malbec. Also the menu was one page starting with title headings of first, second, third. Short and sweet and everything sounded delicious that I knew we couldnt go wrong. We ordered the scallops, Foi Gras, Sea Bass, and Duck. Everything was cooked perfectly, very tasty, and just the right portion. Dinner was not overly expensive. Will definitely be back. Did I mention its only been open for 2 months so it wasn't to busy yet. I can see this place getting very popular and being hard to get a reservation in the future. Great new addition to the DTLA dining scene! White table cloth polish, but comfortable neighborhood feel. Very intriguing menu for foodies. 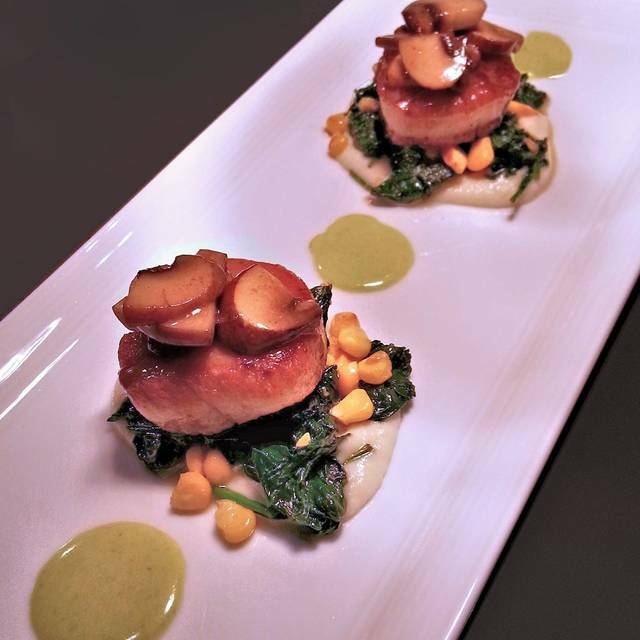 The scallops were delicious, nicely carmelized, on a cauliflower puree with spinach, mushrooms, corn, and little dollops of pea puree on a beautifully composed plate. The trout (it was sea trout, so salmon-like) was perfectly cooked, and nicely complimented with a celeriac puree, spinach, and a dill cream. Great use of seasonal farmer's market ingredients here. We'll be back for sure!